Knowing something’s worth can be tricky. With rumours of premium brands producing in the same factories, as well as using similar materials, as some high street names, price is – in the current menswear market – by no means an indicator of quality. But not to worry, you needn’t delve Sherlock-style into brands’ product development departments to sort the wheat from the chaff – we’ve done the hard work, sourcing the best value clothing and accessories for both shoestring and champagne budgets. Read on to make sure you never get ripped off again. The sheer variety of ASOS’ own-brand tees is mind-boggling, with relaxed-fits, slim-fits, rolled sleeves, V-necks and more available from as little £6 (or less, if you take advantage of the retailer’s frequent promotional offers). Most styles are made from 100 per cent cotton and available in several different colourways, while multi-buy discounts give you the chance to decrease the cost per wear even further. If you’ve got a little more in the bank, then try James Perse. The LA brand’s T-shirts are made in the USA using the finest materials, including Suvin jersey (an ultra-soft Japanese brushed cotton), and are often garment dyed using extra softeners for a lived-in feel you won’t think twice about dropping £50 on. Also worth considering is Canada-born Club Monaco. As well as its excellently appointed mainline collection, the label’s tees are definitely worth nabbing, being a fraction of the price (around the £30-£40 mark) and available in a comprehensive range of colours and finishes, from marl crew necks to cotton-linen blend striped styles. Finally, honourable mentions go to the vast array of Scandinavian brands that focus on producing high quality, simple T-shirts in premium fabrications – and at prices well below ‘designer’ level. Think the likes of NN.07, Our Legacy, Norse Projects and Selected Homme. Swedish brand Nudie Jeans does denim that really can’t be beaten on price. Not only does the label use organic cotton to craft its vast selection of styles (from skinny and stretch to dry selvedge, starting at £89), it also offers free repairs for life – just stop by your nearest Nudie Repair Shop and have your jeans patched up completely free of charge. Alternatively, you can go the all-American route with Levi’s. Home to an especially broad range of styles and fits (starting from £50), Levi’s jeans are also expertly made, tending not to wear under the crotch or lose their shape as easily as similarly priced styles from competitors. Should yours suffer some hardship though, you can always visit one of the brand’s tailor shops to have your denim repaired. Looking for something even more affordable? Uniqlo’s Japanese selvedge denim is one of the best-kept secrets on the high street. The fabrications and choice of fits belie a price tag of just £34.90, and while you won’t get the aftercare of Nudie and Levi’s, for this standard of quality at such a low price, you might not even care. Uniqlo’s Oxford shirts are better made than most competitors’ on the high street, with 100 per cent cotton Easy Care and slim-fit styles available in colours like classic white, grey, baby blue and pink. Not only that, where else are you going to pick up this menswear staple for just £14.90? American-turned-Brit brand Farah might be famed for its chinos, but the label’s shirts are also worth copping for their tailored-fit and high quality construction – though sporting the embroidered ‘F’ comes at a slightly higher price than that of Uniqlo’s logo-free offering (around £55 to be exact). J.Crew and Ralph Lauren have built their reputations on the back of preppy staples such as Oxford shirts, so the cut, details and fabrication of their options have been carefully honed over the years. J.Crew’s aren’t cheap (starting at £72.50), but their lightweight construction and unrivalled softness mean you can wear them year-round. Similarly, Ralph Lauren’s now iconic Oxfords – from £85 – prove their worth through considered details like the iconic logo, premium materials, beautiful trims and an unbeatable spectrum of colours to choose from. Made in the USA, American Apparel’s classic sweatshirts keep their shape and colour for longer than most high street versions, making them a worthwhile purchase if you’ve been forced to tighten your purse strings recently. For an ethical alternative, try Nudie Jeans’ sweatshirts. Manufactured using organic cotton, beautifully cut and available for the modest price of £65, they look like they’re worth twice that amount. Alternatively, if you have a little more to play with, it’s worth investing in Albam – rich, deep colours and soft cotton construction make this independent UK label’s sweats (from £89) really stand out. British brand Sunspel’s minimal designs are the epitome of understated luxury. 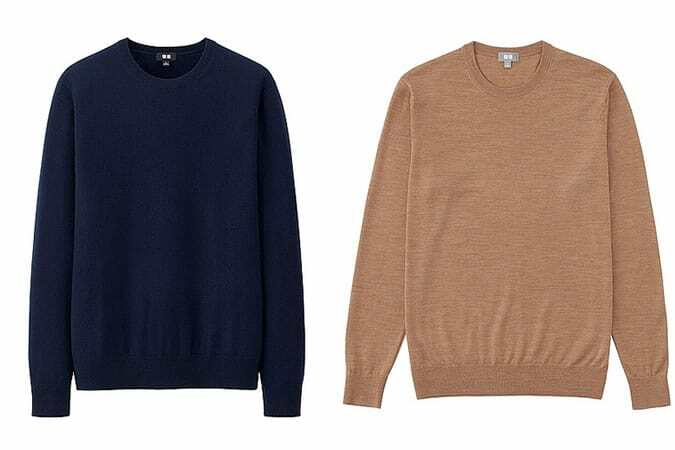 Made using 100 per cent loopback cotton, the 1860-born label’s premium sweatshirts (available from £105) offer unrivalled comfort and will quickly become an off-duty go-to. If you’re looking for decent, wear-with-everything chinos, Mango Man’s come in at under £50, are available in a wide range of cuts and colours (from neutrals to pastels), and feature the Spanish brand’s usual attention to detail. Dockers, owned by Levi’s, boasts the same level of craftsmanship as its sister brand, but shifts the focus from denim to cotton khakis. With over seven fits to choose from, as well as a wide palette of colours, you can secure yourself something from the definitive chinos brand for just £75. Meanwhile, Italian label Incotex’s relentless focus on detail has made it the Maserati of chinos. The brand’s ‘Four Season’ style, cut from cotton-blend twill, is light enough for year-round wear and comes complete with a signature V-cutout at the rear for enhanced movability. Granted, they’re not cheap (£200), but they truly are the best that money can buy and you are guaranteed to get your cost-per-wear from them. If you want cutting-edge tech on a budget, Uniqlo’s quick-dry, moisture-wicking ‘Dry Ex’ polos are a snip at just £14.90 with – on last count – over twenty styles on offer. The Japanese brand’s acclaimed collaborative collections with American designer Michael Bastian are well worth checking out too. If subtle branding is more likely to catch your eye, then turn to Lacoste. The French label’s polos start around the £50 mark and are made from 100 per cent cotton piqué, which holds its colour and shape well, even after multiple washes. However, it’s tough to topple the champion: Fred Perry’s shirts are unbeatable at £55, with their signature tipping, discreet ‘Laurel Wreath’ logo and sharp fit combining to produce what is arguably the definitive polo silhouette. Think Marks & Spencer is all dated wardrobe basics? Think again. As well as its recently overhauled suiting lines, the British retailer’s underwear is definitely worth a look. Swiss label Hanro’s underwear might seem like a serious investment (with styles starting at £17.50), but it’s a wise one, since these blow most designer brands out of the water on the cost-per-wear count. Plus, owing to their hand-picked Egyptian and mercerised cotton fabrications, these briefs and boxers won’t sag or lose their colour as quickly as cheaper alternatives. Although British nightwear specialists Derek Rose might be known for luxury pyjamas, the brand’s underwear is also worth parting with hard-earned cash for. “We wanted to set a new standard in focusing on tiny changes – soft linings to the inside of the waistband, or a magnetic closure on the fly of our boxers – which might be invisible to the naked eye, but make a huge difference to comfort,” says Derek Rose’s Head of Marketing, Tom Parnell. Prices start at £25. Before Japanese retailer Uniqlo, finding premium knitwear at an affordable price was no mean feat. Now, we’re able to pick up 100 per cent cashmere jumpers for an unbelievable £79.90 and extra fine merino wool knits for just £24.50. Although slightly pricier, Reiss’ knitwear offers a high standard of craftsmanship and quality, as well as forward-thinking design. Styles traditionally range between £70-90, but we’d suggest you wait until the sale hits (now, by the way) to take full advantage of the brand’s often deep discounts. Finally, claiming to be “the world’s finest knitwear” may be lofty, but John Smedley is certainly a cut above the rest. Established in 1784, the brand continues to design and manufacture its products in Derbyshire, England, sourcing the finest fabrics from mills across the globe. Expect beautifully soft sea island cotton styles (£130) and extra fine merino wool designs (£140) in a wide range of styles and colourways. Best for slim silhouettes, Reiss has a reputation for putting extra effort into their detailing – think mohair fabrics and updates on classic checks and pinstripes, with prices starting around the £400 mark. For more classic dressers, Charles Tyrwhitt provides British fabric suits for under £500, plus a free personal shopping service at its Jermyn Street store – giving the full sartorial experience at a snip of the price. 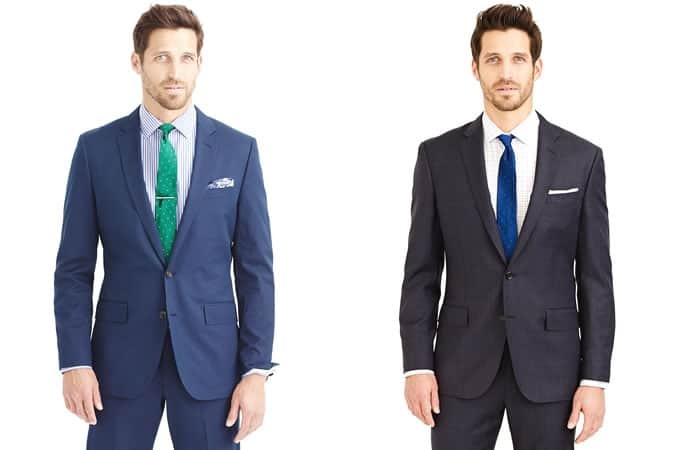 Struggle to find suits that fit your above average body type? J.Crew’s superb Crosby line is designed for athletic frames (with extra room in the shoulders as well as through the thigh and upper arm) and made from specially sourced Italian fabrics, coming in under £450. Many high street stores now offer ‘bespoke on a budget’, but only Dutch company SuitSupply’s tailoring has been compared to Armani’s, thanks to hand-finished detailing and fabrics sourced from some of the finest Italian mills. Fully measured suits start at £569, with jacket prices from £349. If you’ve not visited Clarks since childhood, you’ll be pleasantly surprised by the retailer’s selection of solidly constructed footwear. We’re particular fans of the Torbay collection, which offers minimal suede and leather options under £50, as well as the brand’s iconic desert boots. For sneakerheads, adidas offers good bang for your buck. While competitors’ prices continue to skyrocket, the German brand still offers commendable value with leather Stan Smiths, Gazelles and Superstars for around £65 (though it’s worth shopping around as these models are frequently offered at discounted prices online from other retailers). When it comes to formal silhouettes, Church’s offer some of the best ready-to-wear shoes on the market. Handmade in the brand’s Northamptonshire factory using traditional manufacturing processes, up to 250 steps are taken to meticulously craft each pair. £295 might seem steep, but bear in mind that Goodyear welted construction ensures longevity and allows them to be refurbished as and when required, meaning you can keep your favourite brogues and Derbies in rotation for years to come. If you’re more likely to be seen in a pair of rugged boots than refined brogues, then Minnesota-based bootmaker Red Wing is definitely worth a look. Its wares are handcrafted, stitched to last longer and impeccably finished. Given that you’ll get years of wear out of them, £199 really isn’t that much of a stretch. It may be a cliché but when it comes to securing value for money, it pays to shop around. The pieces – and the brands that produce them – that we’ve pinpointed here will make your money go much further. Which labels have you found offer the best value for money? And do you prefer to spend little and replace often, or invest good money on items built to last?